Luckshmi Sivalingam, Program Officer for Grameen Foundation’s Solutions for the Poorest program, oversees the Livelihood Pathways for the Poorest (LPP) project, and has been working with the field team in Gaya since April 2010 to design the livelihood and financial products, services and methodology making up the integrated livelihoods model. We’ve posted an introduction to her blog post featured at CGAP below, with a link to the full post following it. Our field team held meetings with villages and their leaders using an “interactive and inclusive method of rural appraisal, whereby the community members themselves define what poverty means in their own context and categorize individuals according to local definitions.” Through these discussions, household surveys and use of the Progress out of Poverty Index® (PPI®), a selection criteria for identifying a community’s poorest households was created. Working in partnership with BASIX India’s The Livelihood School, the selection tool is being used to “ensure the inclusion of households currently excluded from microfinance services and government social welfare” in our pilot program. To learn more about how Livelihood Pathways for the Poorest Program is servicing the selected 200 “very poor” households through “financial services and livelihood support,” please read Luckshmi’s full post on the blog of the Consultative Group to Assist the Poor (CGAP). I am about to leave Haiti after four exciting days, and head to Dubai. I am here in connection with Professor Muhammad Yunus’s first trip to Haiti. Highlights abound – it is hard to know where to start. I arrived a day early to do some interviews related to my book on Fonkoze, the country’s leading microfinance institution (MFI). Prof. Yunus’s first stop was a meeting with Haitian President Michel Martelly, who was inaugurated earlier this year. By coincidence, the long process of forming a government (i.e., naming all the ministers who serve under him) had just been completed, so Prof. Yunus was able to meet all the new cabinet members just before they were to be introduced to the country. President Martelly expressed sincere interest in helping create a positive environment for social business – Prof. Yunus’s main passion now – as well as microfinance. 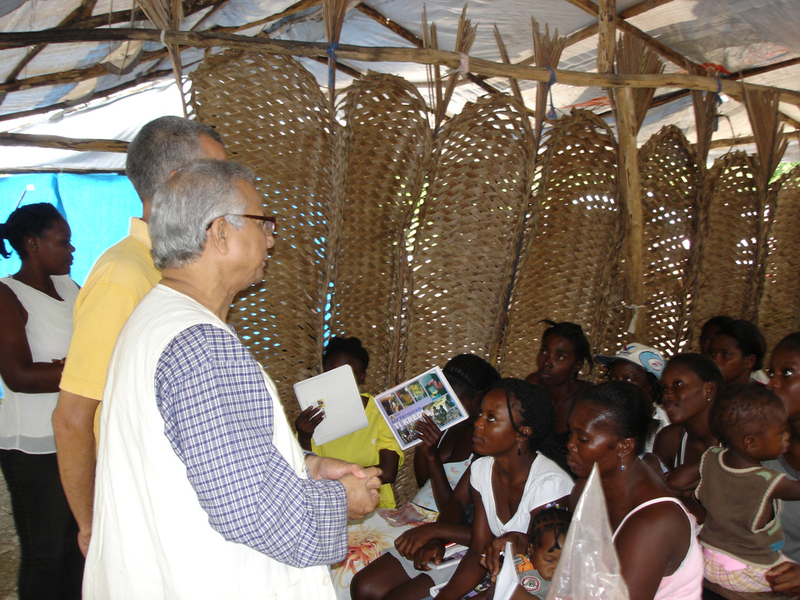 Prof. Muhammad Yunus talks to a group of borrowers involved in Fonkoze's “Ti Kredi” program. He also talked about how he was afraid that the aid coming to Haiti after the earthquake would be wasted unless it was used to build up independence, rather than greater dependence on charity. Finally, he told some stories about Grameen Bank and its history, and marveled at how microfinance has grown globally to almost every country, mentioning Fonkoze and its status as the leading MFI there (eliciting spontaneous applause) and celebrating Grameen Foundation’s important role in supporting Fonkoze. The conference continued through midday Friday. Anne Hastings, the director of Fonkoze Financial Services (Fonkoze’s for-profit arm), and I were on a panel with Prof. Yunus, where – alongside two Haitian economists – we responded to questions posed by the moderator and the audience. In response to a question about my upcoming book on Fonkoze, I said that it was critical features for microfinance and social business to rigorously track social-impact outcomes. In that context, I explained how the Progress out of Poverty Index® was based on Grameen Bank’s 10 Indicators of Poverty and had been incorporated into Fonkoze’s own social-impact monitoring tool. 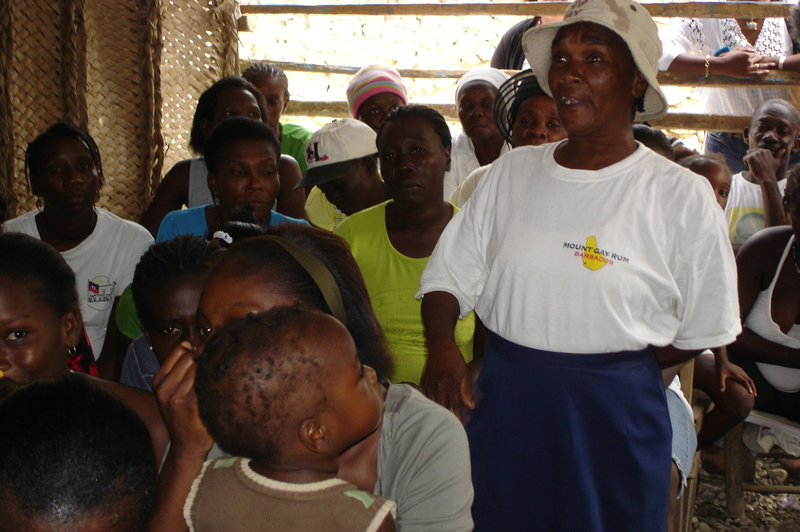 In response to another question, I said that there were potentially powerful alliances between MFIs and their most successful clients on the one hand, and the social business movement in Haiti on the other. Anne added some excellent points that built on those made by Prof. Yunus. On Saturday, we took a field trip together. The highlight was the first stop – visiting a Fonkoze “Ti Kredi” center of about 50 women who 10 days earlier had just gotten their first loan of $25. (They are to make their first payments next Wednesday.) After long-time Fonkoze employee Gautier Dieudonne introduced him, Prof. Yunus spoke to the group about Grameen Bank, Bangladesh, microfinance, mangos and much else, and asked the women a lot of questions. There was much laughter during some of the lighthearted exchanges, while serious topics were also explored, related to how microfinance can go off course at the village level and nationally – and what can be done about it. He asked how much local moneylenders charge – the answer was 20% per month – and the women praised Fonkoze for offering a much lower rate. After the center meeting we had a nice afternoon with representatives from Zanmi Lasante/Partners in Health, the organizations founded by Paul Farmer. Fonkoze borrower Clenie Brisfor tells Prof. Yunus that, with access to small loans through Fonkoze, "We can make progress!" I wonder how many Americans understand what $25 – or even 5 cents – can do to change someone’s life, as well as their sense of what is possible? As we’ve seen again and again, access to financial services can provide the poor with an opportunity to empower themselves, live up to their potential and realize the human dignity that we all deserve.